NOTE: This post has been updated. See below. The mainstream media love police shootings and the subsequent reactions, sometimes violent. No, I don’t mean that way — I mean that they give the twenty-four hour news cycle something to pontificate about endlessly (usually from the left) … but most especially they open up opportunities for academic “experts” to jump in and opine. 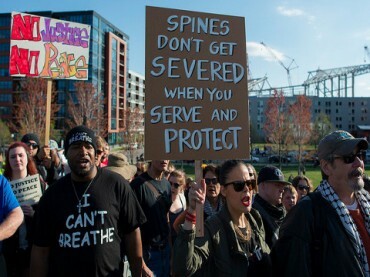 The protests/riots in Baltimore this past week certainly were no exception. Take Vanderbilt’s Tony N. Brown for starters. Professor Brown, a member of the school’s sociology department, argues that “white privilege” is to blame for Baltimore’s woes. “White people act ‘routinely to harm, demean, and damage black and brown people’ … These actions ‘explain the lofty levels of frustration and despair among black and brown youth,’” he writes in The Tennessean, Nashville’s largest newspaper. The professor then offers a solution to help “combat” white racism: “create a massive, grassroots surveillance network to capture video evidence” of it. Use cell phones and GoPro camcorders to “record the discourteous way co-workers or service industry workers or police officers treat you,” Brown writes in The Tennessean. “Then let’s all post our videos,” Brown declares concerning the vague last step in his racism surveillance scheme. Does anyone think that these “real discussions” will include the fact that (liberal) Democrats have run the city for over two generations? That African-Americans have held significant power in the city for years? Pogue apparently is not aware that the Baltimore Police Department is about half minority, and that half of the accused officers in the Freddie Gray case are African-American. And he definitely isn’t aware that white officers “often wrongfully kill[ing]” black suspects is an outright falsehood. 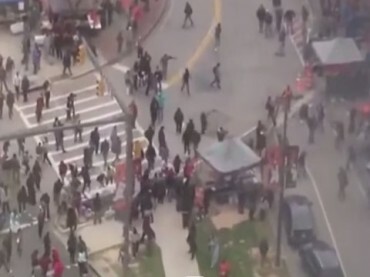 The University of the District of Columbia Law School dean, Shelley Broderick, offered to delay exams for students who would head over to Baltimore and offer free legal advice to protesters. Cooper also refers to Baltimore’s mayor, Stephanie Rawlings-Blake, as well as Gen. Linda Singh of the Maryland National Guard and new US Attorney General Loretta Lynch as “white supremacists in Blackface.” Because, after all, they “do the state’s bidding.” Or something. UPDATE: The original version of this article attributed an opinion by Young Conservative’s David Rufful to American University’s Stacey Patton. We regret the error.